Yesterday, a Florida judge appointed by former Republican Gov. Jeb Bush struck down current Republican Gov. Rick Scott’s attempt to impound voting machines to disrupt the recount, and the judge told everyone to tone down the rhetoric about elections supposedly being “stolen.” Scott then dropped his motion to quarantine voting machines within his purview, and was subsequently sued by a group of Florida voters and grassroots organizations, as they alleged that the governor abused his power to try to swing the outcome of his race for senator and the contest to replace Scott as governor. Democrats filed another lawsuit in Florida yesterday: calls to count votes postmarked by election day even if they were received afterward. Screencap has the gist of it. This is an outright attack on our democracy. 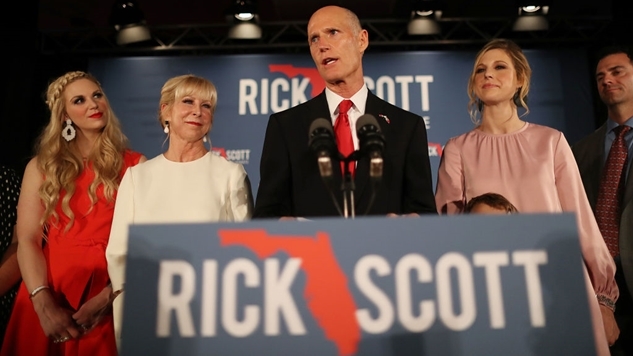 Florida law mandates that if an election is within 0.5%, an automatic recount is triggered, and Scott is using that as a springboard for a larger attack against the very concept of elections. The premise from Republicans like Scott essentially goes that if a Democrat is winning in a non-deep blue state, some shenanigans must be going on. The backdrop to all this is that by Thursday, 700,000 ballots need to be recounted in Broward County and 600,000 in Palm Beach County. So the question becomes: if a judge believes that Rick Scott’s extraordinary request to impound voting machines was over the line, and Scott’s own election monitors and law enforcement officials say there is no voter fraud in these heavily Democratic counties, why is Rick Scott (and Marco Rubio) making such a big stink over counting all the votes? Florida is home to some of the most restrictive voting laws in the country (one of which was overturned this cycle, giving roughly 1.4 million ex-felons the right to vote), and with each attack on democracy from people who are poised to win these elections, you can’t help but wonder if they’re trying to conceal more subtle attacks on our democracy that helped them win these elections.